More than 500 species of hermit crabs exist throughout the world. These typically nocturnal crustaceans have exoskeletons that they shed many times in a process called molting. Hermit crabs can be either terrestrial, or land-dwelling, or aquatic, which means water-dwelling. They don’t grow their own shells, they appropriate discarded shells of dead mollusks such as moon snails. Terrestrial hermit crabs have solid-colored legs, most often red or purple. Aquatic hermit crabs, on the other hand, have multicolored, striped or speckled legs. Since they dwell in water, their shells often are covered in barnacles -- something with which their terrestrial counterparts don’t have to deal. Terrestrial hermit crabs tend to make their homes in muddy or sandy areas within 500 feet of shore. Other terrestrial hermit crabs live in forests, sticking to high sand hills and even traveling across mountains. 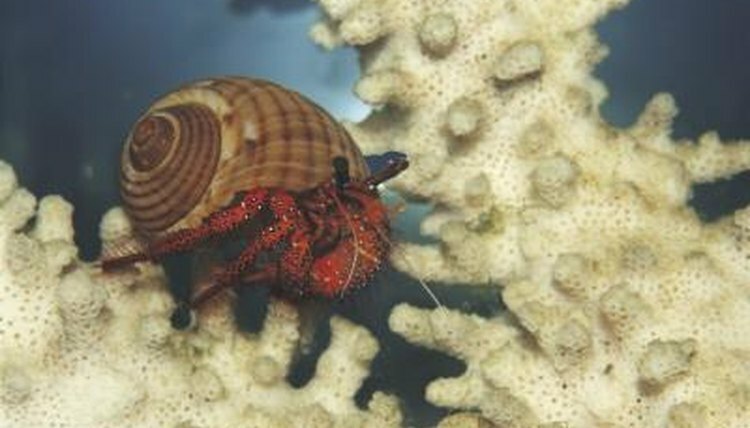 Aquatic hermit crabs, on the other hand, tend to keep to shallow waters near coral reefs and intertidal areas, near food sources, most notably plankton. Some aquatic species prefer deeper waters, but usually no deeper than 450 feet. Whether they dwell in land or water, all hermit crabs are scavengers. They consume everything from turtle eggs and dead fish to plants, fruit that has fallen from trees and anything edible they find on the ocean floor. Despite having different habitats, aquatic and terrestrial hermit crabs are quite similar. Aquatic and terrestrial hermit crabs are nocturnal, which helps them avoid predators. They are also social creatures, preferring to live and forage together in groups. Despite their social nature, aquatic and terrestrial hermit crabs will fight over shells and attempt to steal them from each other. Aquatic and terrestrial hermit crabs go through four stages of sexual maturity. During the naupilus stage, the hermit crab is a larva still inside his egg. His body is unsegmented. He has only one eye and has three pairs of legs. Next, the hermit crab undergoes the protozoea stage, which also happens while he's inside his egg. In the following zoea stage, the hermit crab hatches from his egg and has at least one spine on his back and rudimentary legs on his abdomen and thorax. The final stage is the megalopa. During this stage, the hermit crab appears as a miniature version of an adult hermit crab. Terrestrial hermit crabs mate in January and February and carry their eggs for two months, unlike their aquatic cousins, who reproduce during the entire year. Although terrestrial hermit crabs are more commonly found in pet shops, both terrestrial and aquatic hermit crabs are suitable as pets. Hermit crabs can live well past a decade if their habitat is recreated successfully and their care meticulous. They require tanks that afford them plenty of space to move around and hide. Temperature must be regulated for both terrestrial and aquatic hermit crabs. Terrestrial hermit crabs tend to be more popular since pet owners do not have to worry about regulating water temperatures and keeping the water clean. Terrestrial hermit crabs are popular first pets for kids because they allow an opportunity to teach a child responsibility. An aquatic hermit crab is too much responsibility. This one's suited to the dedicated hobbyist rather than the first-time pet owner.